The year 1945 saw the defeat of Nazi Germany and later the fall of Imperial Japan, and with it the end of captivity, many years in some cases, and an end to the harsh and sometimes brutal conditions the men lived in. The men in German hands at least had the consolation that the Germans had notified the Red Cross and that their families at least knew they were alive, and they received the occasional Red Cross parcel. For men in Japanese hands life was very different, the Japanese did not recognise the Geneva Convention and whether they notified relatives of a man’s capture was very much hit or miss. Conversely cards would arrive saying the man was a POW and well, but several months had elapsed by which time the man had died from illness, starvation or had been executed by the Japanese. In Bonnyrigg there was good news, Corporal Watson Crozier of the Cameron Highlanders was welcomed home to his sister’s house in Eldindean. He had been liberated by the Red Army as they pushed through Eastern Europe towards Germany. His sister had received a telegram from Watson the previous week, a regular soldier, he had been with the colours since 1934 when he enlisted as a boy of 17, it was the first time he had been home since then. The telegram read “Arrived safe. See you soon.” These brief words signalled the end of his time behind the wire that had started in 1942 when he had been captured at Tobruk. After his initial stay with the Germans he was transferred to an Italian POW camp in Italy. Cpl Crozier said he had no admiration whatsoever for the Italians and had been treated very badly by them and nearly starved. Fortunately his stay in Italy was short and he was transferred to Germany first to Stalag 8B, then to a work camp E711 in Upper Silesia where he was held along with 3000 mostly British prisoners, whilst there he was made to work in a factory manufacturing coal by products. He recalls with great fondness the Red Cross parcels “If it had not be for them, we would have been in a very bad state. The Red Cross also provided games, footballs and other gear for sports. Musical instruments were received and we had a camp orchestra, concerts were often arranged. Books for commercial courses were received and many prisoners took advantage of this to obtain qualifications.” He also recalls that contact with German populace was strictly forbidden, and he had little knowledge of their attitude to the war. In January, 1945 the Russian Army rolled into Upper Silesia, the Germans pulled the POWs back from the battle zone except 60 who were too sick to travel. Taking advantage of the confusion caused by the retreat Crozier and some of his mates slipped away and went into hiding until the Russians had overran the defences. Heading into Russian territory they presented themselves to the Red Army, they were given food and hitch hiked for three weeks until they arrived at Krakov in Poland. After a few days in Krakov, during which time they were well looked after by the Russians, they were put on a train to Odessa in the Ukraine and shipped home to the United Kingdom. Being a regular there was no demob for Watson Crozier and after six weeks leave, it was back to soldiering for him. Another man who had been captured at Tobruk was former Dalekithian, Lance Bombardier Norman Morrison, who’s parents resided in the High Street Dalkeith. He had immigrated to South Africa in the late 20′s and had enlisted in the South African Forces at the start of the war. His homecoming was a lot quicker than Watson Crozier’s. 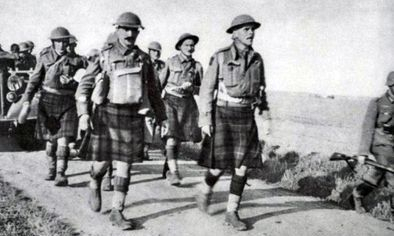 His camp had been liberated by the Americans on the 11th of April, within 48 hours he was back in England, and not long after he was home in Dalkeith, the first time in 9 years he had set foot there, he enjoyed a months leave in the 30s before returning to South Africa. Coming back with him on the train was Private Andrew Reilly,(37) from Dalkeith, he rejoined his old regiment The Black Watch in 1939 and was captured in the heroic rearguard action at St Valery in 1940 where the 51st Highland Division sacrificed itself so many men could make it back to Britain to fight again. After his capture he was route marched to Holland for three weeks with virtually no food, then stuck on barges to Germany and eventually on to Poland. He spent most of his war engaged in construction work and said he had been treated fairly. As the Russians advanced he had been moved back into Germany and was liberated by the Americans at Hanover on 11th April, 1945. In Eldindean Terrace, Bonnyrigg, Watson Crozier was not the only man receiving a hero’s welcome . Pte Andrew Bowman, King’s Own Scottish Borderers was returning home after five years behind the wire, the whole street had got the bunting out to welcome Andrew home, it was a very emotional, bitter sweet moment for everyone, they were delighted to see Andrew, but two of his brothers had been killed during the war. Two of his neighbours Mrs Young and Miss Harper presented Andrew with a gift of money from all those in the street with their best wishes. Andrew (27) had been captured in 1940 at Leforges, and like Andrew Reilly he had been route marched for three weeks. During the march their only rations were three biscuits and half a cup of coffee a day. Near the end of the march they were given horse meat soup, I bet no one was bothered about horse meat then. He was then held in Marienburg XXB before spending most of the war working on farms in Prussia where he was quite well treated, being worked hard and fed well. His working day was normally 14 or 15 hours long and he received payment of 4 Marks 20 Pfennings, about 4 Shillings or 20 pence in British money. Andrew received no letters or parcels from home for the first year after which they arrived fairly regularly. Some of the guards were very friendly and happy to barter for goodies in Red Cross parcels, an indication that times were tough for Germans. In 1945 the Russians were getting very near, Andrew was being held in a town almost at the Russian-German border. At 8 o’clock one morning the Russians could be heard nearby, and the POWs were moved out of Rosenburg, less than two hours later the Russians took the town. The prisoners were marched 10km to Freistadt where a scene of chaos greeted them, German refugees fleeing and troops being rushed to the front to confront the Allies. Thus began a trek of 1000km over a period of two months in the depths of a Central European winter. 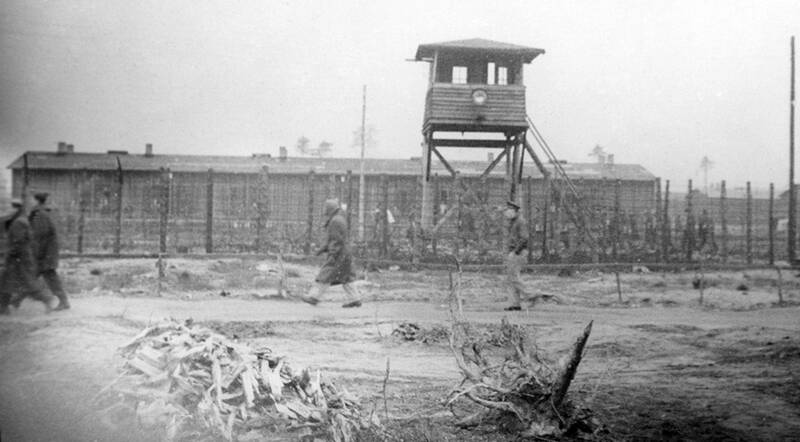 For those who were prisoners of the Japanese, the outlook was very grim indeed. You can read about their experiences and the horror the endured here.